Perhaps it was the contrast between the Arctic weather sweeping around Beetham Plaza that Saturday night and the cozy glow of the dining room, or the cheery welcome from the front desk, but I have rarely had my expectations of a meal turned around so dramatically by just walking through a restaurant's front door. It's not that I wasn't expecting much of Etsu; it had been recommended and I wouldn't have been there at all had I not been mildly optimistic, but this was, after all, a Japanese restaurant in Liverpool. And while competition for Spanish and Chinese (not to mention British) joints has created the likes of Lunya, Yuet Ben and 60 Hope Street (all worth visiting), if your closest rival is a Yo! Sushi then you really don't have to try too hard to be the best. But Etsu are trying, and trying bloody hard, and, more importantly, passing with flying colours. The service was the first indication this was an operation with heart and soul - front of house in Liverpool are known for their friendliness and enthusiasm, less so (it has to be said) for their knowledge of whatever it is they're serving. 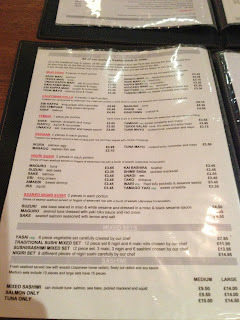 Here though, every item of every dish was explained in detail on request, and the traditional Scouse charm was matched with an efficiency I've not seen anywhere else in the city. Which would have all meant nothing, of course, had the food not been up to scratch. 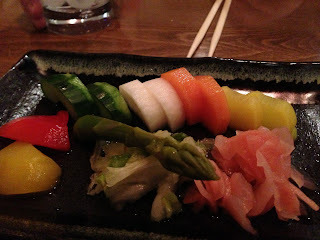 But even the most humble of dishes we ordered, such as these house pickles, showed an attention to detail that punched far above the very reasonable amount they were charging for it. It was all good, but some cabbage was my favourite, perfectly balanced between sweet and sour with just a hint of kimchi-like fermentation. 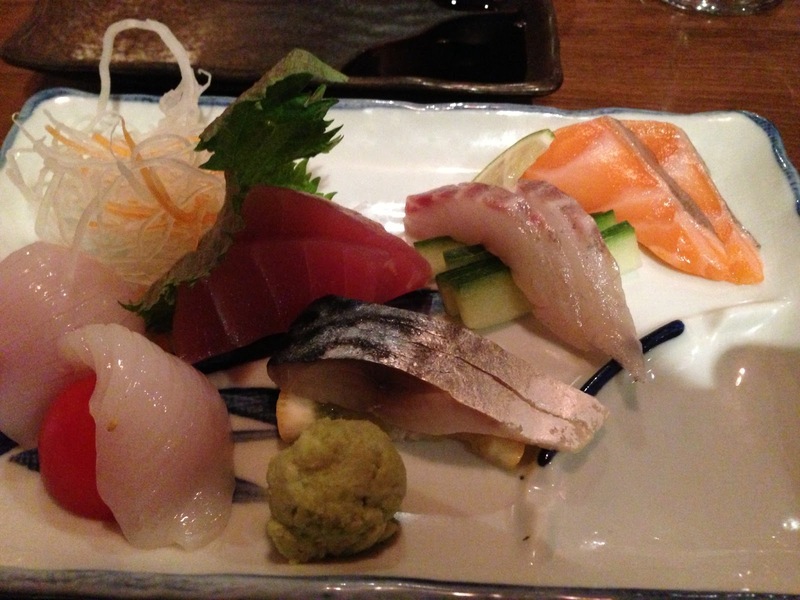 Sashimi, whilst having the most potential for disaster, acquitted itself perfectly well. It's probably not their fault I had a slightly better selection at Roka a couple of days previously, but it's also worth pointing out that the selection at Roka was a very similar volume of food and cost £28. This cost £9.50. 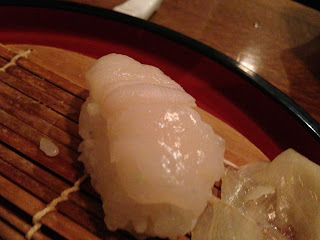 Some scallop nigiri though were lovely, as were a couple of pieces of gunkan masago, involving capelin roe. I'm afraid there's no picture of those as they disappeared almost as soon as they were placed on the table, they were that good. 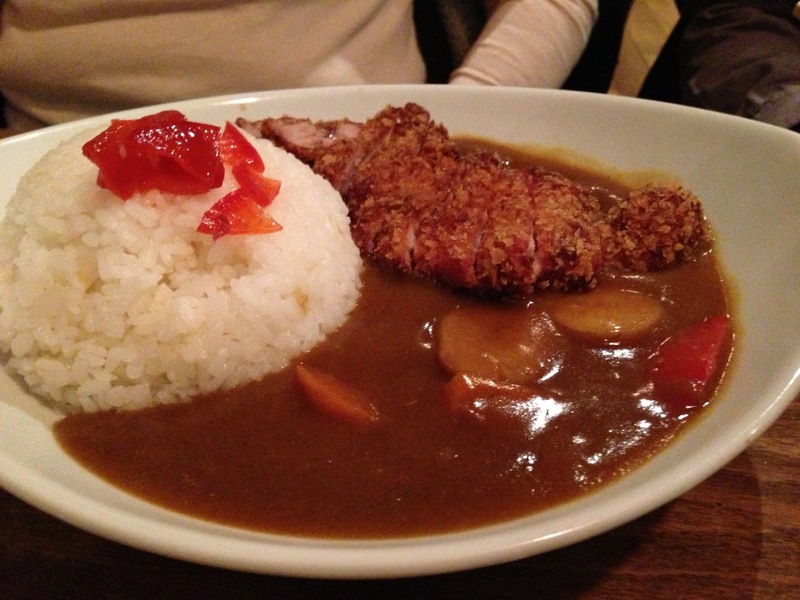 With the trend in London towards extreme specialisation, especially with Japanese restaurants (Koya for udon, Tonkotsu for ramen, Shiori for Kaiseki etc) it was a surprise at first - not to mention a slight worry - to see sashimi, katsu curry, udon and tempura all on the same menu. But the breadcrumbed chicken in curry sauce was at least as good as that you can get from Wasabi, and I happen to think the Wasabi katsu curry is pretty good. At least, it was before they saw fit to change the recipe and serve it in a weird TV dinner tray and douse the fried chicken with tamarind. Can I have my little hot cardboard pot of rice and fried chicken with curry sauce on the side back please? Sorry, I digress. Yasai tempura udon was very well done, the noodles thick and meaty, the broth rich and comforting, and the bits of fried veg light enough to enjoy without a hint of grease-induced queasiness. In fact this was probably the most impressive dish of all, showcasing a number of different techniques on one plate and getting all of it as close to correct as makes no odds. 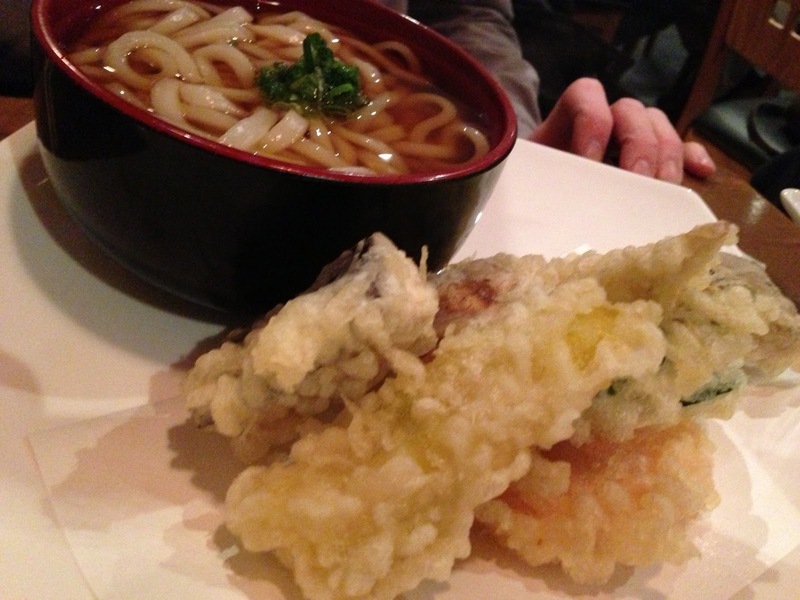 Sashimi may "just" be fresh fish on a plate, but good bubbly tempura requires quite a bit of skill. 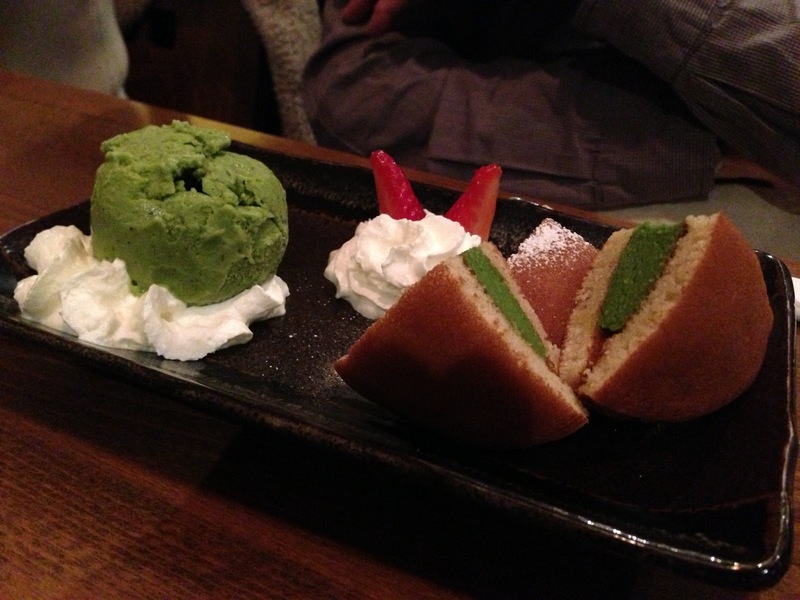 The fact we decided to squeeze in a final course of matcha doriyaki despite being quite full shows how much we didn't want the evening to end. 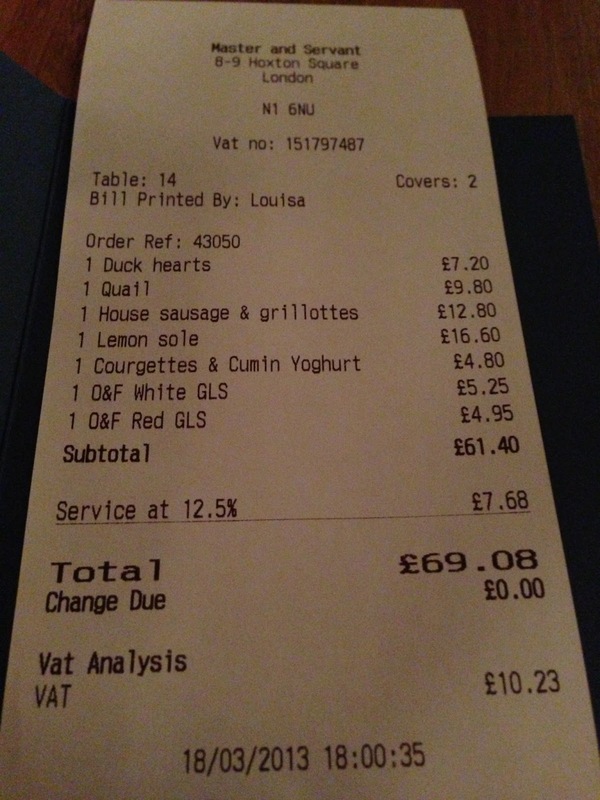 It was worth every bit of the £5.45, moist and not too sweet, and like everything else was served with a smile. And it's the service, I think, that I will remember most about Etsu. That seems harsh on the food, but I don't mean it to - everything we ordered ranged from good to excellent and was priced so low I wondered at first whether our bill was a mistake - but in a town where the most you can usually expect from your waiter or waitress is that they bring you what you order and don't accidentally break any of your limbs in the process, to interact with such enthusiastic, happy people over the course of a couple of hours was an absolute joy. 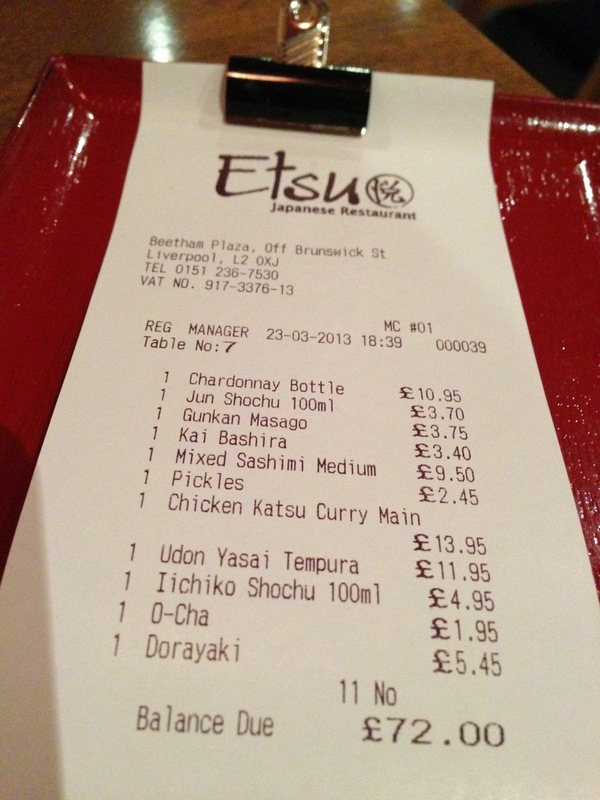 And it's also the reason why, at this moment in time, Etsu may just be the best restaurant in Liverpool. 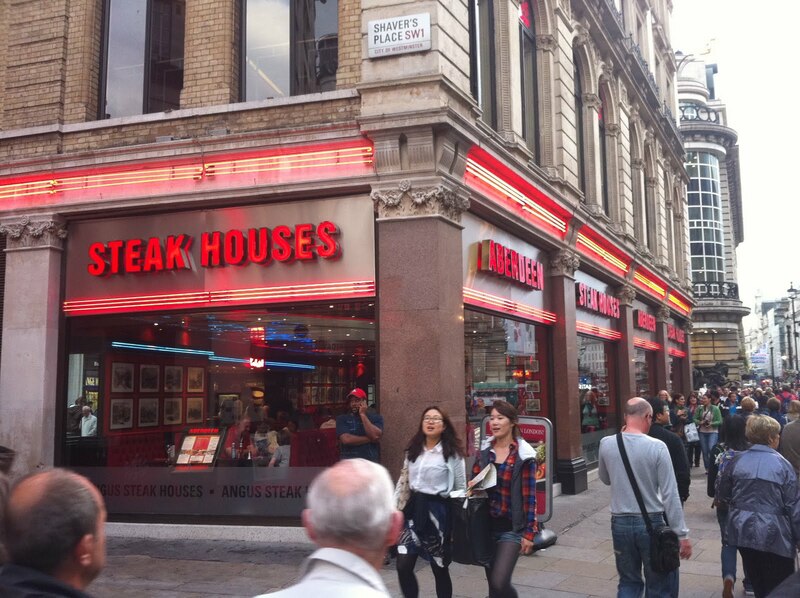 Damn you Quality Chop House. Not because you're not a good restaurant - I'm fairly confident you are - but because, thanks to a power cut last night you were closed, and having got myself in the mind for a nice meal out I decided to stay on the 243 bus and try a new place in Hoxton Square instead of just going home and having some reheated pizza. Which would have been a far less painful option, as it turns out. But there's no point wondering what could have been. What's done is done. 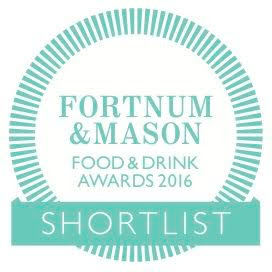 And instead of adding my voice to the tidal wave of praise for Quality Chop House, which I fully intend to do as soon as soon their lights are back on, I'll have to tell you about Master & Servant. 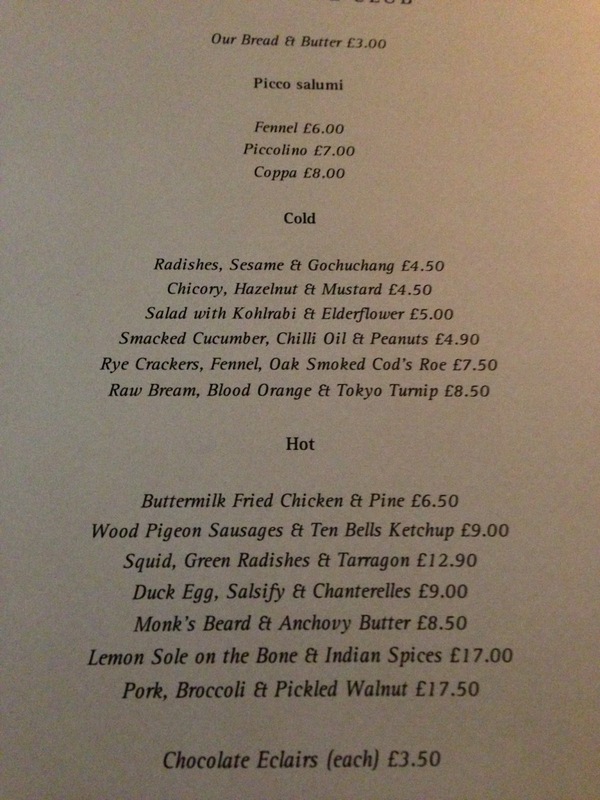 It's in Hoxton Square, it serves (eventually) a menu of modern British dishes, and I wish I'd gone straight home and reheated some pizza instead. The first sign something was wrong was the fact that for most of the long, long time we spent sat in that draughty dining room, we were the only customers. Master & Servant is still a relatively new place - it replaces a mediocre Thai restaurant which never seemed to have anyone in it either - but even so you'd expect a bit more interest from the new restaurant capital of London (Shoreditch) than that, especially given the menu reads rather well. Oysters, devilled duck hearts, half crab & mayonnaise, ox cheek and celeriac - these are crowd-pleasing dishes that when made well could lift any jaded diner's heart. So it was with great optimism we ordered a few of them and waited for the show to begin. And waited. And waited. One glass of wine turned into three, house bread was nibbled at then picked off then replaced. Six o'clock turned into seven, and still no sign of any food. Then just as we were wondering if we shouldn't just cut and run (oh how I wish we had), a commotion on the other side of the room. The good news was that our starters had arrived; the bad news was that the waitress had accidentally tipped the whole lot of them down the stairs and so we had to wait - again - for them to be replaced. Mystifyingly, although it had taken a full hour for Master & Servant to make some food to throw down the stairs, it took only another 5 minutes to replace those same dishes and bring them to the table. Even so, we soon wished they hadn't bothered. 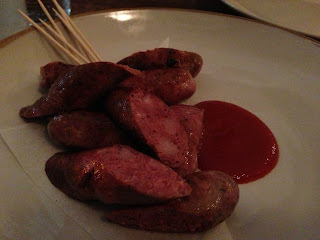 Grilled duck hearts, to pick the first thing we tried, were a winning combination of greasy and over-vinegared, like they'd been soaked in cold oil then doused in Sarson's. Very bizarre. House sausages tasted OK at first but had a distressing farty aftertaste which lingered well into the late evening. 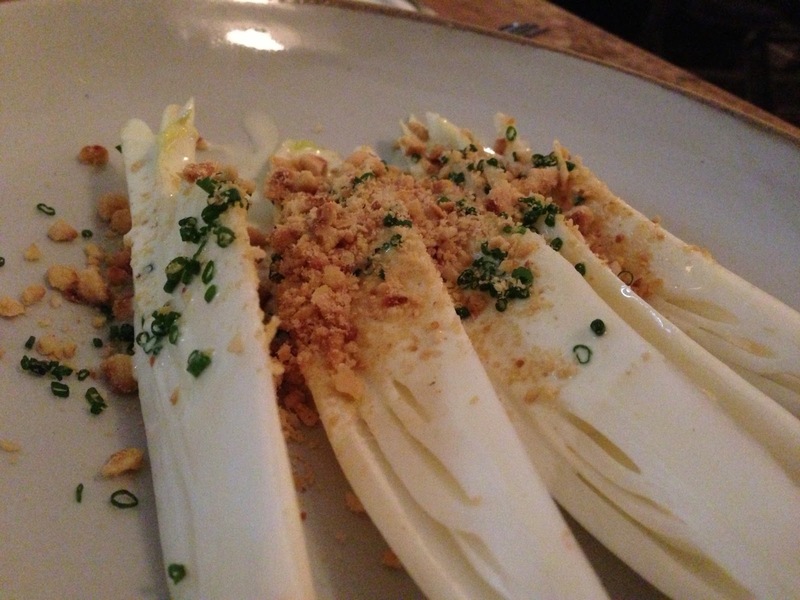 They came presented on two whole baked onions which tasted like whole baked onions. And a grilled quail was completely unseasoned and desperately dull, despite having been crisped up on the grill to a good texture. Kudos to Master & Servant at least for finding a way of making quail boring; I never would have thought it possible until last night. 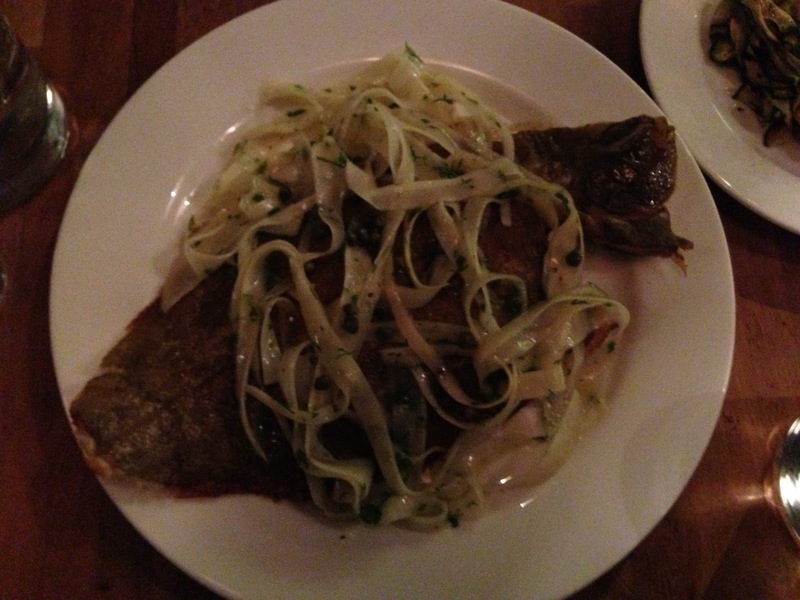 After those three abominations, we awaited the arrival of the one main course - lemon sole - with a combination of morbid curiosity and terror. It didn't disappoint. Overcooked and mushy, with a skin of grey leather that peeled off like soggy kitchen towel, it was covered in a mound of pickled salsify which cleverly managed to highlight the lack of seasoning in the fish, as well as being inedibly sweet itself. 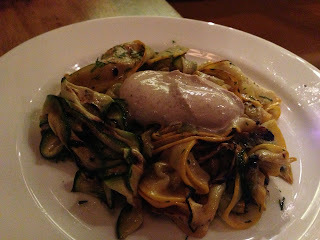 And even a day later the memory of a side of "courgettes, cumin & yoghurt" is making me gag - that's cold, slimy courgettes, shredded into thick noodles for who knows what reason, and topped with a blob of cumin-thickened yoghurt. "It tastes", said my friend, "like armpit sweat and deodorant". To give Master & Servant a grain of credit where due, they did take a couple of glasses of wine off the bill to apologise for the wait, which I suppose is something. 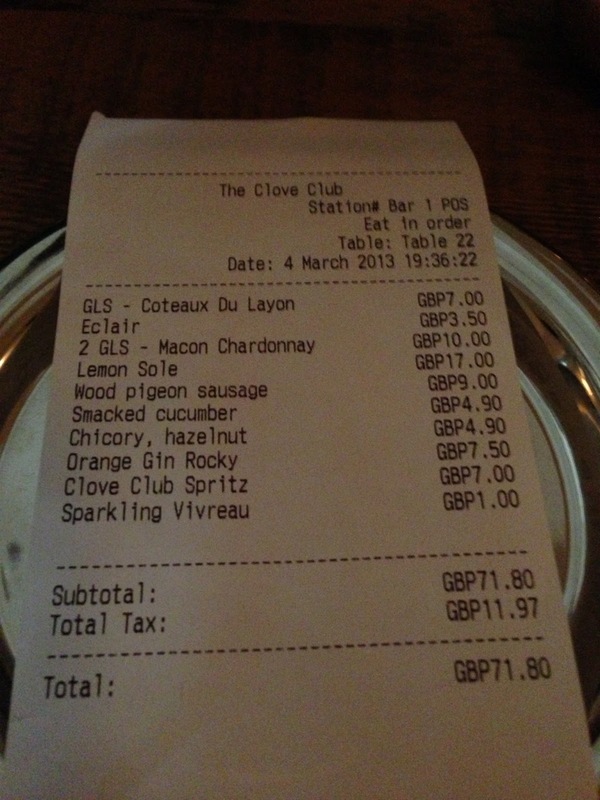 But even with a discount the total came to £70, which is still approximately £70 more than what it was worth. It was in shock as much as sadness, though, that we paid up and queasily slunk out. More than anything, it just didn't seem fair. We did nothing wrong - we ordered in good faith, carefully and in a promising area of town, in an attractively designed restaurant with a very appealing menu. And yet somehow events had conspired to produce a truly terrible meal. What had we done to deserve it? Anyway, lesson learned. Next time I have it in my mind to visit a new restaurant that everyone's talking about, and it's closed for whatever reason, I won't try and find a short notice backup on the same bus route. I'll turn around and go home and reheat some pizza. Sometimes it's best to know when you're beaten. Given what happened last time I put a blogpost subject up for public vote (you utter bastards), you may be wondering why I'd put myself through the same ordeal again. It's a fair question. But I'd be a fool to think most of you aren't only reading these pages for the occasional sadistic pleasure of seeing me spend my hard earned on a diabolical meal, and there's always the chance you might send me to Le Gavroche or Pollen Street Social instead of the Clapham Junction branch of Wimpy. So instead of pre-populating the poll with nice places I actually want to go to like last year, I'm going to call your bluff and start you off with a list of real shockers. Then hopefully, thanks to a clever bit of reverse psychology you'll add your own nice options and I'll end up somewhere good. Oh, who am I kidding. Do your worst. 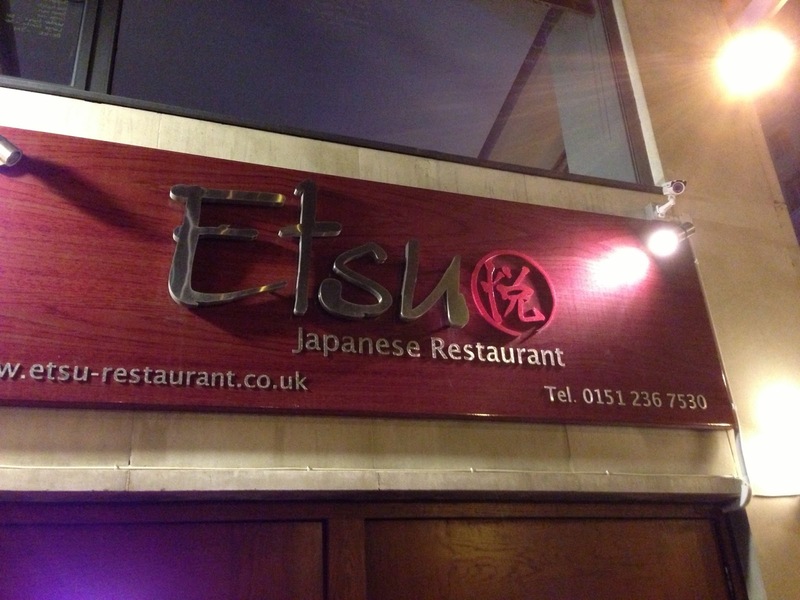 EDIT 15/03/13: It appears I'll be going to Mr Wu's all-you-can-eat Chinese buffet. I hope you're all very pleased with yourselves. Parts of San Francisco, this will not be news to many of you, are quite spectacularly beautiful. You'll have seen the impossibly severe roads lined with picturebox Victorian rowhouses, the Golden Gate Bridge, the cable cars and the glittering waterfront from countless travelogues and movie locations, but up close it's all even more impressive. The Pacific Heights and Telegraph Hill areas of town, in particular, have a unique kind of dramatic impact; standing at a street junction with one road plunging down towards Alcatraz Island and the other soaring infeasibly skyward is equally jaw-dropping and unnerving, like that scene from Inception when the buildings start folding up and over themselves. It's almost enough to put your off your lunch. I said almost. Given my priorities when visiting a new city position eating and drinking significantly higher than sleeping or breathing, I had a list of places to cram into a whistle-stop 3-day stay, and all a strenuous traipse up and down Lombard St was going to do was work up an appetite. So breakfast at the excellent Thorough Bread bakery near our Air B&B in Castro gave way to a an obligatory terrifying cable car ride up to Russian Hill (surprising how paranoid Americans are about health and safety in most cases, and yet are quite happy to make you hang on white-knuckled to the back of a covered wheelbarrow as it hurtles up a mountain) and lunch at Leopold's. A boisterous Austrian gastaus isn't the first thing that might come to mind when thinking of San Francisco, but a beer and a poached egg salad was just the ticket after barely having time to work off a pound of pastries from Thorough Bread. A white bean soup, too, was typically hearty Austrian fayre, even if we weren't as badly as need of its warmth as presumably most are in Austria this time of year, and one of our party even managed to stretch to a pile of grilled sausage and sauerkraut, all very well received. Maverick, a restaurant in Castro serving regional (largely southern) cuisine had the kind of menu an American food obsessive like me dreams about. The buttermilk fried chicken was predictably brilliant, as were some miniature lemon tarts for dessert, but the star of the evening was devilled eggs with caviar, the kind of dish that can make an entire trip. We still talk about it. The next evening was Oscar Night, and I'm afraid the first real disappointment. No, not just Brave winning Best Animated Feature (I mean come on, ahead of Frankenweenie, ParaNorman, Pirates! and Wreck-It Ralph? Are they insane?) - a takeaway from Mission Chinese. I am painfully aware that judging a venue on its takeaway offering is a bit like having a beer in the street outside Harry's Bar then moaning about the lack of complimentary peanuts, but we really found it hard to see what all the fuss was about. For a not insignificant chunk of cash, lamb ribs were 99% fat, Mapo Tofu was notable for little other than its eye-watering dry heat, and all dishes, including the famous Chongqing chicken wings and Kung Pao pastrami, were disastrously salty. I've since learned that the head chef has left to do something in New York, which may explain something, if not excuse it. The next morning though, a stunning selection of pastries at Tartine got us back on track. One of the most acclaimed bakeries in the US, if not the world, Tartine is always busy and always churns out incredible product. The gigantic ham and cheese croissant, for example, was so astonishingly good with its dark crust, soft filling and perfect balance of dairy and protein that I can hardly believe a better version is made anywhere in France. The only downside, in fact, is that given Tartine's immense popularity, much like anywhere else that has them queuing round the block no matter what, the serving staff aren't often all sweetness and light. I realise it must stressful dealing with such huge numbers all day every day with no end in sight, but as we were unceremoniously chucked our carefully-selected purchases and told to bugger off (I paraphrase) a quote from Absolutely Fabulous came to mind from when Edina found herself in a Kensington art gallery - "You only work in a shop you know. You can drop the attitude." And talking of bad attitudes, this might be a good time to bring up the biggest problem I had with this city, something which really took a shine off most of the many wonderful things it has to offer - San Francisco is Crazy Central. In no other place in the world have I ever seen so many drug casualties, hoboes, lunatics and destitutes. We were shouted at on the bus, screamed at in the street, sung to, propositioned and abused more or less wherever we went. Sure the smart areas of town had fewer issues, but it seemed every tiny area of public space was a cardboard city or had people pushing their belongings round in a old shopping trolley, and it made getting around - particularly on public transport though by no means exclusively - a bit, well, unpredictable. I'm not going to pretend I have any idea why the problems should be so bad here and why elsewhere in California seems to have more of a handle on it, but it's certainly something to be aware of. I swear I will end this post on a lighter note, but we have one more disappointment to get out of the way first. I don't know what's happened to Chez Panisse since it was one of the most well-regarded and famous restaurants in the US, but I can only tell you time has not been kind on this Berkeley stalwart and these days the pioneer of California cuisine now appears happy to charge credulous guests (that would be me then) a vast amount for dreadfully boring food. Perhaps in 1971 it was acceptable to charge $150 a head for a spinach & ricotta pie, some greasy pieces of duck and a (actually this was OK) crème caramel, but we left feeling completely ripped off. Thoroughly not recommended, although I promise it wasn't me that set fire to it a couple of days ago. But happier times awaited elsewhere. Back in Mission the next day we jumped in the queue for Dynamo Donuts, surely the next imported American fad to hit London if these are anything to go by (Electric Donuts have already made a start). Lovely friendly staff and great fresh donuts with a variety of very interesting toppings such as "Meyer lemon and huckleberry" or "passionfruit milk chocolate". And just round the corner, another first - lunch at an El Salvadorian restaurant for pupusa, a kind of thick corn tortilla filled with cheese and pork. The pupusa were very nice - incredibly filling for something so deceptively small and pretty cheap, but a huge bowl of shrimp soup was the unexpected star of the meal, powerfully flavoured with a generous number of plump, juicy shrimp. At the very least, I'm glad they turned out better than the "Mushy Disturbances of Corn" promised by my specially-purchased augmented-reality translation app (above). Ah, I almost forgot. Straight from the airport early in the morning on the first day we hired a car and drove to Napa. A brief tasting at the Alpha Omega vineyard opened the door to lunch, and we found ourselves in the Oxbow market just down the road, sat at the bar at the Hog Island Oyster co. It is difficult, in fact I might argue impossible, not to enjoy yourself eating fresh oysters, drinking Sauvignon Blanc and pulling apart whole Dungeness crabs of an afternoon, and it is this place I think reflects the side of San Francisco cuisine the world is more familiar with - fresh seafood, served with charm and with a nice cold glass of local wine. 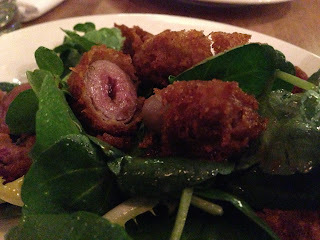 A strong start, and end, to the trip then, and plenty to love in-between, but like the city itself geographically and otherwise, the food was (groan) a bit up and down. Tartine aside, we seemed to do better by avoiding the big names and just wandering into whichever little place was nearest, which also had the advantage of not requiring risking life and limb by travelling on public transport. Getting there was a cinch, though, thanks to Virgin America, our little house in Castro was a joy, and though it will never replace dear old San Diego in my affections, it's clear there's a lot more to know of this enigmatic, topsy-turvy town. In the beginning, three chefs, Ben Greeno, James Lowe and Isaac McHale, having trained at some of the most influential restaurants in the world (Noma, the Ledbury, etc. ), began running special evenings under the collective name the Young Turks. Invariably wildly popular, and winning lavish praise from anyone lucky enough to attend, it was inevitable that they would attract the attention of the movers and shakers and before long Greeno was cherry-picked by David Chang to launch his Sydney outpost of Momofuku. By all accounts, he's doing very well. So then there were two. Lowe and McHale, after gracing the rooftops of Peckham with a popup at Frank's Campari bar in the summer of 2011, began a residency in the newly refurbished upstairs dining room of the Ten Bells pub in Spitalfields, where the reviews were similarly salivating. I ate at Upstairs a couple of times and it really was very good indeed; don't ask me why I never wrote it up, I definitely should have done, sometimes these things happen. And now there is one. McHale, now Lowe-less but accompanied by the two giants of front of house (in both senses of the word) Daniel and Johnny, has moved into an annex of the Shoreditch Town Hall once occupied by the disastrously ill-conceived Monsieur M (you know what an area of town blessed with lots of amazing Vietnamese restaurants didn't need? 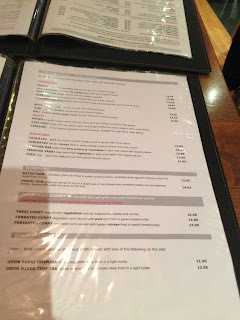 A mediocre Vietnamese restaurant). 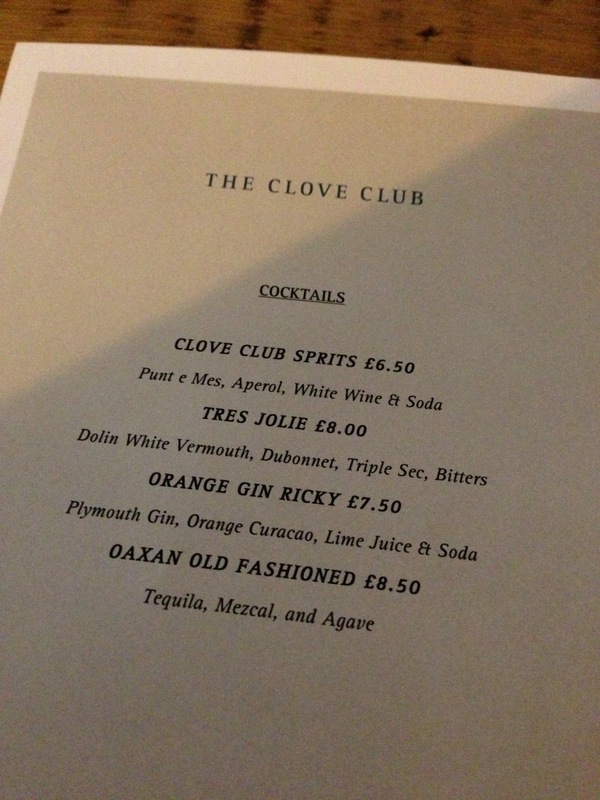 It's called the Clove Club, it opened on Monday and you should go as soon as you can. OK, so I've long been a fan of the Young Turks' output and this was never likely to be a negative post. And I hesitate after the drubbing David Sexton got on Twitter for his not wholly upbeat writeup of the opening night in the Standard, because I was there the same evening albeit in the more informal a la carte bar area. But given the quality of the dishes we were served, the slick service and the generally positive vibes that chime through every element of this operation, I'm going to go out on a limb and guess there were other factors at play in that piece than a desire to be objective. Put it this way - if you ever read a restaurant review that grumps just as much about "hipsters and food bloggers" and a "yearningly aspirational diaspora" as the food, then take the star rating with a pinch of salt. Anyway, it's about time I told you what you get for your £35 a head. 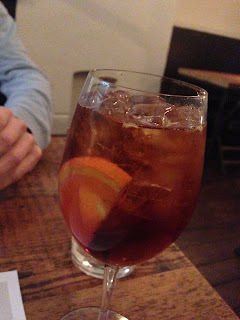 A short list of house cocktails were all refreshingly unsweet and reasonably priced. 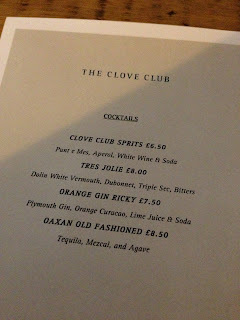 "Clove Club Sprits[sic]" was a Polpo-a-like aperitif served in a wineglass, while an "Orange Gin Ricky" was an straightforwardly quaffable highball of fresh juice and gin. 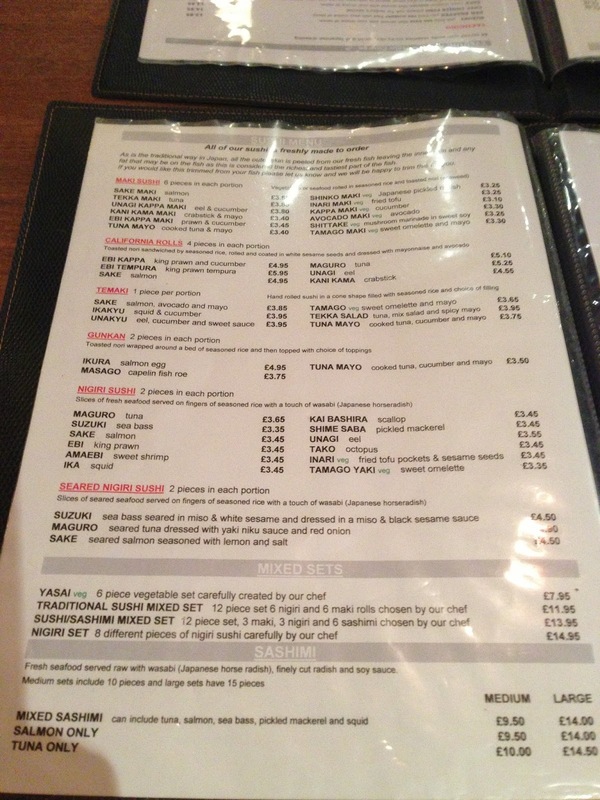 Dishes, while vaguely distinguishable by price point, are only divided on the menu into 'cold' and 'hot' rather than 'starters' and 'mains', and arrive as and when unless instructed otherwise. 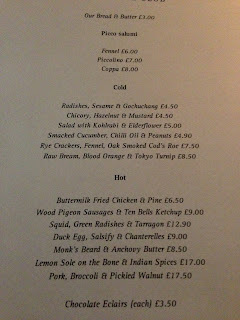 This is, of course, how it should be on a bar menu designed for sharing, and at least prevents anything hanging around for ages under a heat lamp slowly baking. First thing we tried were some pretty fingers of sliced chicory, I think gently cooked somehow as they had none of that usual extreme bitterness of raw chicory, dressed in a light cream dressing and topped with toasted hazelnuts. Like Upstairs and his previous ventures, much of McHale's food has a masterful control of texture, used to often stunning effect. If you were lucky enough to try the grouse sausages served at the Young Turks Frank's dinner, then you will love the pigeon variety served at the Clove Club. Whoever they've found to create these unctuous, gamey little beggars deserves a big pat on the back, and matching them with a powerful fermented chilli "ketchup" is inspired. The "ketchup", in fact (really a hot sauce in the Sriracha vein but actually far nicer) should really be available to buy - I imagine it would go with just about anything. "Lemon Sole and Indian Spices" was the kind of thing that could either be a complete disaster or the highlight of an evening. Fortunately, this was the latter. 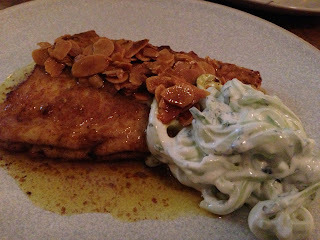 A soft, light piece of fresh fish was coated in the most incredible complex, buttery coating and topped with toasted almonds, creating a dish that satisfied in every department. The raita-style crunchy dressing added a cooling touch, and lifting the flesh off the bone was a rare treat. Having ordered savoury courses quite conservatively and buoyed by what we'd eaten so far, desserts were requested without a second thought. 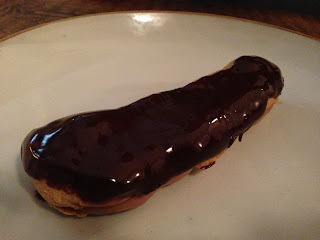 The single official dessert on the bar menu is an éclair, and bloody lovely it is too - all light and freshness and way more attractive than my murky photo suggests. 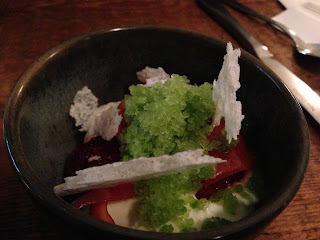 But we were also treated to a refugee from the tasting menu next door, a bowl of warm blood orange, sheep's milk and wild fennel which, like everything else, was a deceptively complex arrangement of flavours and textures, temperatures and techniques. 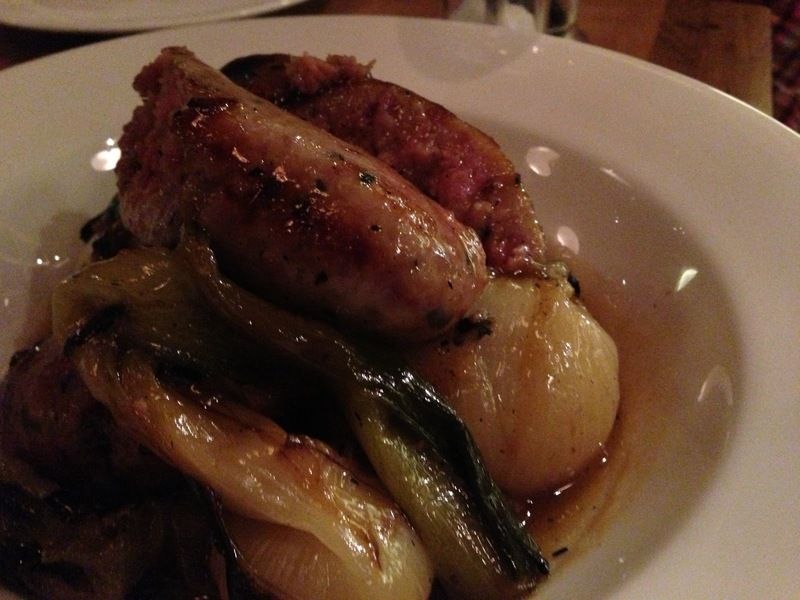 It was great, and only reinforced my desire to go back for the Full Monty. 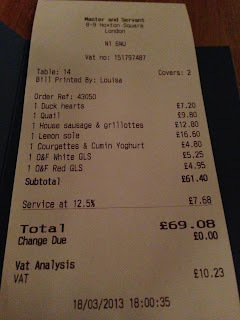 With three glasses of wine plus a very pleasant side of smacked cucumber I completely forgot to take a photo of, I think £71.80 is a very reasonable total for food of this standard. 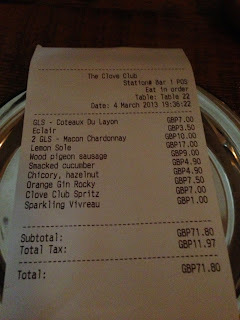 Service isn't added on, which is a lovely touch, but unfortunately water is - we had asked for tap, was told that the water from the bar was all tap even if we wanted sparkling anyway, but then were charged £1 for something called "Vivreau". So they lose a point for that. Oh and some of the window tables are a bit draughty. But these are niggles. 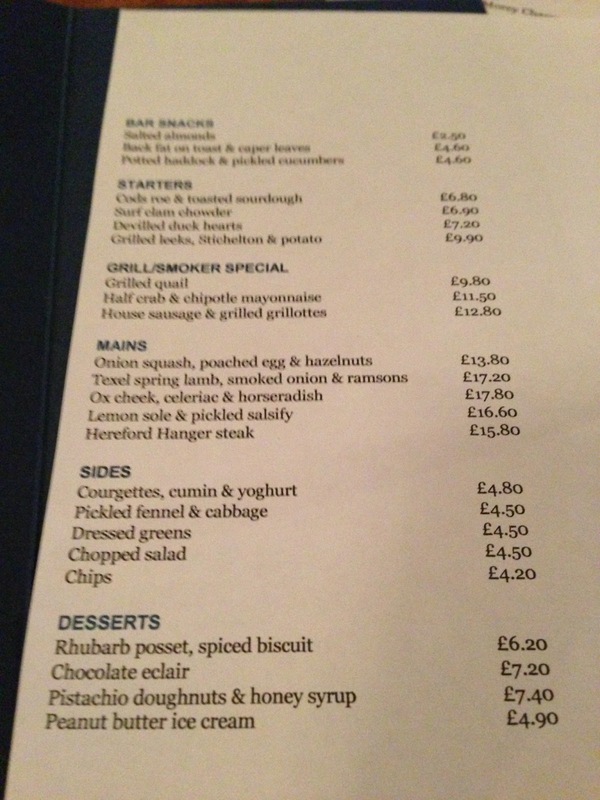 As I've been at pains to point out, these are very early days - the earliest day in fact - and only the bar menu not the full multi-course multi-sensory experience offered in the main dining hall next door. But you don't always need an exhaustive sampling of every corner of a restaurant's offering to know when you're onto a good thing. In fact, you very rarely do. Based on the all of the above, the pedigree of a chef like McHale and my burning desire to revisit as soon as possible, the Clove Club is a smash.